I have two posts today which originated from the same idea. I wanted to try the spotlight technique from The Treehouse and thought I would do a distressed design using a tag. The stamp is from Hero Arts and called Skyland Bookmark. I stamped two of the images and used the Nestabilities Labels Four to cut part of it out. I coloured it using both Promarkers and DIs round the edges and then covered it with tattered rose distress stickles. 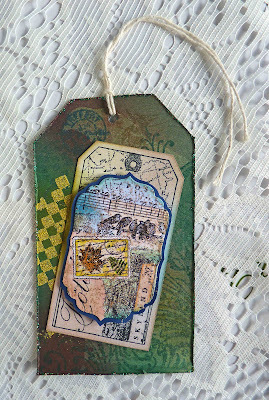 The tag was distressed with DIs and I used a variety of stamps for the background, I also experimented with the TH distress embossing powders. I finished off by using the holly stickles round the edge. There's a fab challenge at Tuesday Taggers this week, sponsored by Georgina. Have a look at her blog for some great inspiration. Love your tag. Definitely "Tim Holtz"! p.s. where did you get your tags from as I can't find any? Gorgeous tag - love the colours and the detail. Thanks for taking in my challenge ar Allsorts this week. Hi Brenda gorgeous tag and sounds like you had a lot of fun creating it. Did you see Georgina our fab GD this week has donated a prize to be in chance to win you need to add a little link :) thanks for taggin' us at TT this week. Fantastic tag Brenda great attention to detail. Don't forget to pop a link to Georgina for a chance to win her prize. Thanks for playing along with TT this week. Stunning tag, Brenda! Love the colours and what you have done with the HA stamp. Thanks for joining us at TT this week! Great Tag! I love the touch of gold on it. Im so glad you decided to share with us this week at For Fun Challenges. Beautiful tag Brenda! Thanks for joining in the Pollycraft Challenge this week.